One of the highlights of the Eurovision Song Contest Final from last night was the program in the intermission: The Swedish Smorgasbord, by Petra Mede, Swedish comedienne, dancer and television host. This is her presentation of Sweden and Swedes for all those of you who are curious – and Swedes to be entertained. Our relationship to church, the need of consensus – even at the combat zone, the talent of doing compost, Carola and many more goodies at the smorgasbord. Yesterday The Eurovision Song Contest 2013 Final was held in Malmo, in Sweden. What I didn’t know was that the Eurovision was created 57 years ago by a group of broadcasters with the intent to unify Europe after world war II through the power of music. It makes total sense. And today the event is bigger than ever. The event opened with a newly composed Eurovision Anthem “We Write The Story”, written by Benny Andersson and Björn Ulvaeus. and the Swedish DJ, and record producer Avicii. “We couldn’t get ABBA – but ABA”, as Petra Mede introduced them. A master piece. Here it is. Enjoy! “We have a choice in everything, we write the story…” – what are you making a choice about today? What is the next chapter in your story? 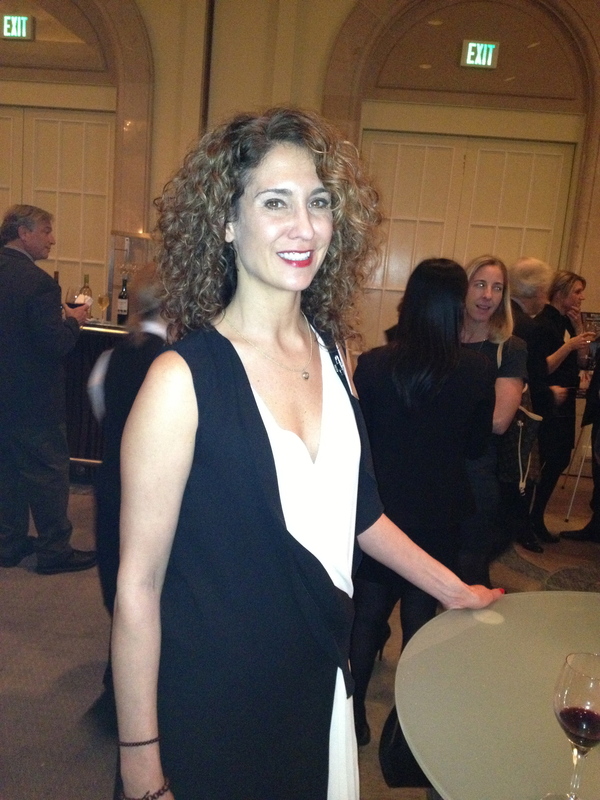 Earlier this year I attended the event of the year hosted by San Francisco Business Times – “The Book of the List Party”. I was there with my friend Sandra Philips, branding and PR professional, and we were after having talked with various people, the exhibiting companies and enjoyed a little bit of the delicious food, standing catching up ourselves. Up to us comes a man wanting to talk, and asks how we are doing this evening. As a response when we are returning the question he says: “It is great. I have had a lot of exciting conversations”. Later on when I hear what his profession is I can’t help but smile – given that this event was slightly male dominated, I am sure he had a lot of “exciting conversations” – he was at the time launching a course for men learning how to come eight times in one evening. He talks some about what he does, and then he turns the focus on us. “But I am curious – how is it for you both to be single in San Francisco?” Surprised I express “What makes you think that?” He continues: “Well, you know, it is not easy to find a great partner. You may meet someone who is considerate, successful, handsome, and tall – but can he dance?” Now I was even more surprised. I know I am easy to read (in my mind) – but THAT easy? He suddenly gained some points. The question is: can he dance? How many of you is that important to? And what is the reason for dancing being important? Today, as a reminder about the event, the winning song Waterloo by ABBA from 1974 was shared (see below). For all ABBA lovers: since last week, there is now ABBA The Museum open in Stockholm. It is part of a larger Swedish Music Hall of Fame. I am sure it partly covers the impact ABBA has had on it’s fans. I have only in the past two months in San Francisco met one, and heard another, case of women that have learnt Swedish for the only reason that they loved ABBA. As of me… I was Agneta. And yes, I do have the ABBA music book with me… to San Francisco. What has ABBA done for you? Mother’s Day in the US is coming up. My a cappella group Keeva has a concert in the Church of Sweden – upstairs with the view over the Golden Gate Bridge and Alcatraz. – bring your mom and family – or just yourself! 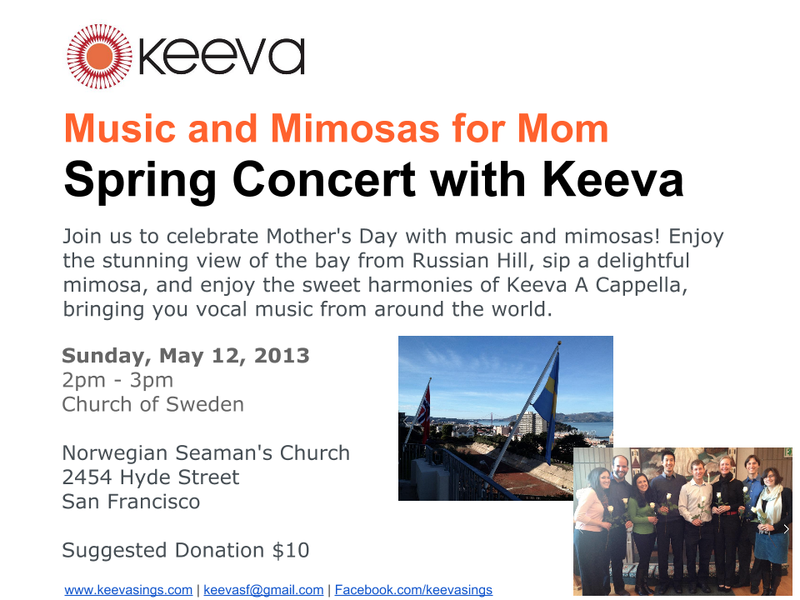 – after your mother’s day brunch and enjoy some mimosa and music.